As I’m sure everyone knows, Wednesday was April Fool’s Day. Some stars took to Twitter to try to trick their followers, and some went all out. Check out the most noteworthy celebrity April Fool’s tweets; some were a hit with the fans, and some were pretty controversial. Taylor Swift kicked off the day with sharing her strategy for April Fool’s Day. I guess if you are hiding in your kitchen cabinet, you’re a lot less likely to fall for anyone’s tricks. 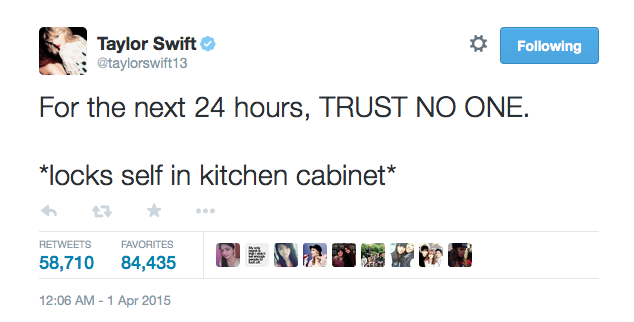 You can always count on Taylor to be hilarious and relatable on Twitter! Sam Smith’s joke was one of the most controversial celebrity tweets of the day. A few minutes after apparently breaking the news that he was straight, he did a follow-up tweet saying how he was joking. However, the damage had already been done. Many people started attacking him on Twitter saying the joke was in very poor taste, pointing out how sexuality is not something to kid about when people struggle with it every day. Followers also pointed out how sexuality is not a choice, either, which is what they thought Sam was implying with this tweet. Personally, I think he sincerely meant it as a joke and people are blowing this out of proportion. Hopefully he can recover soon from this. I think someone needs to give Josh Duggar a lesson in pulling a prank… Usually you don’t tell people you’re joking until after the trick has been played. At first glance, it appears that Josh was congratulating his sister Jill Dillard and her husband on twins, which fans knew Jill wasn’t supposed to be expecting. However, he kind of ruined the joke with the #AprilFools, letting all the followers immediately know he was not serious. I’m sure it still did give some fans a surprise for a second, though. Rainn Wilson took a more serious approach to the pranking, letting his followers know he was quitting Twitter. This was not a cool joke to play, Rainn! What would we do without Dwight Schrute’s hilarious tweets? Thankfully, he was kidding, so there will be plenty more Rainn to come. What did you think of these celebrity pranks? Which one was your favorite? Let us know in the comments or tweet us using #glamorouspaper!